March is National Reading Awareness Month, and we’re definitely a house that enjoys to read! I love to read for enjoyment, and I hope I can spread that reading joy on to my kids. While I appreciate paper books, lately I’ve been hooked on reading Kindle ebooks. They’re able to be downloaded instantly, and take up so little room on trips. Now I have a great way to allow my girls the same access to ebooks, Amazon FreeTime Unlimited! Faith intently focused on reading with her Kindle e-reader! One of my worries about the girls using tablets for reading ebooks has been the screen time use. However, with a simple Kindle e-reader, my girls can read as much as they want without the blue light and screen time worry. I love the idea of giving my girls access to a bookshelf of thousands of books, plus the ability to borrow ebooks from our library. Recently when we took a weekend road trip vacation, I was able to load up six books for Faith to enjoy on the drive. Normally we’d have to pack a stack of paper books, but the Kindle e-reader made it so easy to take a variety of books along for the ride. FreeTime Unlimited is the best subscription service for helping get more books into your kids’ hands! For a monthly rate as low as $2.99, you’re given unlimited access to hundreds of hand-picked chapter books and early readers, all curated for age-appropriateness, so parents don’t have to spend time and money guessing what their kids will enjoy. Kids can choose from 45 different book categories like Disney, Animals, Sports, Adventure, and Science. Then with a simple touch, the book can be downloaded via WiFi into their bookshelf. Another feature of FreeTime Unlimited is the Vocabulary Builder. When turned on, kids can look up words in their books and those words get stored away for them to review later on. So many books in each category to download for free – 88 books in the Sports & Athletes category! So far Faith has chosen books from Disney Cars, Beverly Hills Chihuahua, Epic Mickey, Spooky Buddies, and even an illustrated kitten book. One of the fun parts of FreeTime Unlimited is that kids can earn award achievements for their reading. Faith loves seeing a new achievement notice pop up. 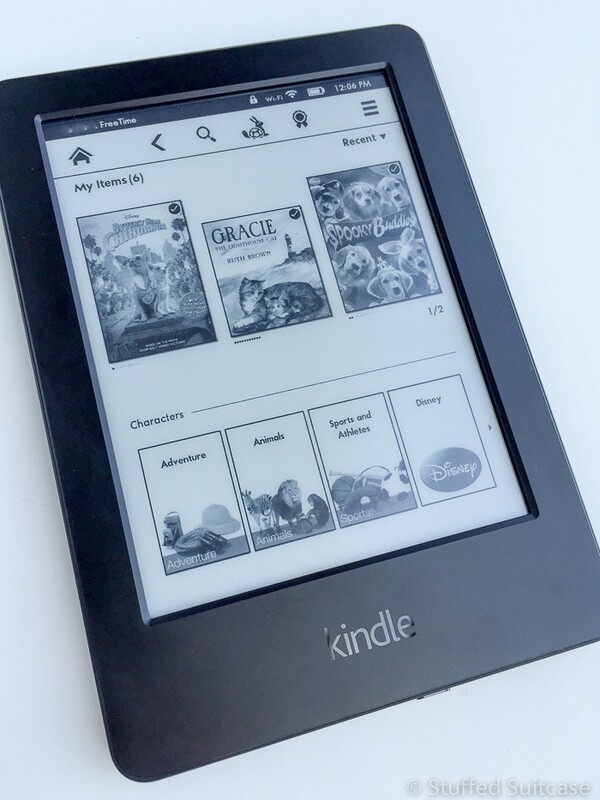 This is a great way to help encourage your kids to read more, plus with the Kindle e-reader, it’s a great way of merging kids’ love of technology with reading! Kids earn awards for their reading achievements! We have the largest FreeTime Unlimited plan ($6.99/mo for Prime members), so I can download books for both girls and enter a password to switch between accounts. The plan we’re on allows for up to four children and one adult, which means I can have my own books on the device too! 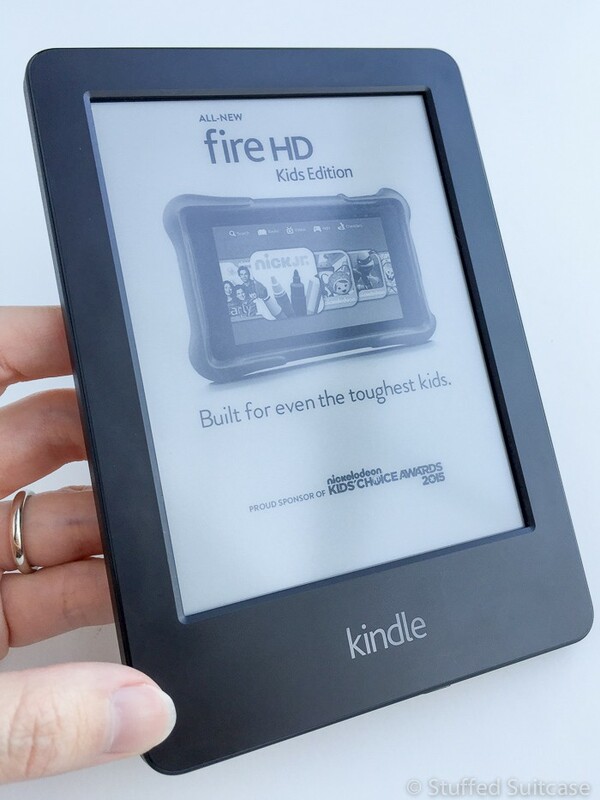 If you want to include games and videos along with books, you can use the plan on a Kindle Fire. Great as an all-in-one device for family vacations! FreeTime Unlimited with a Kindle Fire means free access to books, games, and videos! Let me know if you have any questions about how we’re using FreeTime Unlimited! Maybe this will help give you an idea for an upcoming road trip or gift idea! Comment below if you’ve done anything fun for National Reading Awareness Month! I love my kids Kindles! It is so great to just be able to download another book when they finish one! I’ve not heard of Free Time Unlimited before, but it sounds awesome! Off to check it out now. Great Krista! I was amazed at all the books that are on there! As a primary school teacher, reading every day and establishing that love of reading, is the best thing any parent can do for their child. I love that you have found such a great way to do this while traveling without sacrificing a lot of space. I hope more and more people look into this! Thanks so much for commenting Corinnne! I’m loving the simple grab and go option that the Kindle allows. So great for travel! And just buying one book a month for my daughter costs about $6.99, so with the FreeTime Unlimited I can spend that same amount but both girls can have tons of books at their disposal, plus borrow ebooks from the library. Thanks for this great review…question. Is there a limit to how many books you can have downloaded at a time? We are doing some travel this summer and my kiddo reads at least a chapter book a day (new reader very excited!) and I’m no lugging a stack of books internationally. TIA. Hi Anne, I think my girls only used a bit of the space, maybe 10 books at a time. If you’re using a traditional Kindle you can save a lot of books on the devices; if you’re using a Fire tablet, the storage space might be a bit limited if you also have movies and a lot of apps installed. It’s so great for traveling light! Do you think it would be a good fit for a 9 year old girl who is a great reader? Are there lots of chapter books or is it mostly toddler/smaller children books that are available? I can’t seem to find a list of books available. Thanks in advance. Does the Kindle Fire HD8 kids edition read aloud for my smaller children? Or is that not a feature? Hi Roger – I’m not sure if they have narrated books as an option. I do know that you can see if a kindle book has the text to speech ability and I believe that allows the book to be read, but I don’t believe it will read it aloud in picture books and such. There is also audible which you could look into adding, or if you buy books you can choose Whispersync enabled kids books (but I’m only seeing books for elementary kids, not super young). But if I’m understanding you correctly, I don’t think your kids can click on a word in a book and have the book read aloud to them. You might consider looking on youtube for some reviews to see if it’s possible. I did a bit of searching for you on google and I’m not seeing it. HOWEVER, another option would be to download a read aloud to me app from the amazon appstore and they could listen to books via the app. Hope that helps!